The Lakelands Area Retreat and Cancer Centre (LARCC) has re-located to Multyfarnham Abbey. LARCC Centre (www.larcc.ie) gives support and holistic help to people living with cancer, providing a supportive enviornment where patients and family members can participate in courses, obtain information and experience complementary therapies. Unique to LARCC is its Residential/Take a Break Week, the only cancer support centre in Ireland running such a programme. The purpose of the five day residential programme is to take clients on a personal journey of relaxation, reflection and recovery by skilled therapists, nurses and counsellors. The move from Ballinalack to this purpose-built centre at Multyfarnham will provide LARCC the chance to grow and develop as an essential cancer support centre in the Midlands. 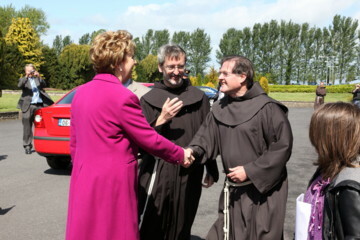 The new Centre was opened by President Mary McAleese on Friday 20 May. The friars continue to maintain a residential presence at the Abbey, and Masses, confessions and novenas still take place. In 2005 the Provincial Chapter of the Irish Franciscans had decided to develop new initiatives in relation to the buildings and lands at Multyfarnham Abbey. The opening of the new centre is a part of this redevelopment. The Order is not seeking a commercial return on these assets. 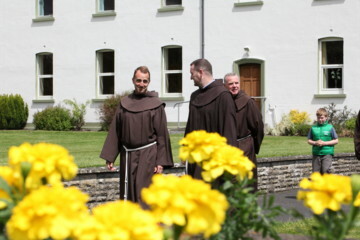 Rather the Franciscans hope that the resources be used for purposes which are consistent with Franciscan values and which will contribute to the economic, social, cultural and educational development of the North Westmeath area. The whole history of the Franciscan Order in Multyfarnham, stretching back nearly 750 years, and the beauty of the church and grounds will significantly complement the new, modern facilities which are being developed within the complex at Multyfarnham Abbey.